Our product range includes a wide range of barcode weighing scale. Barcode weighing scale is used for Generate Barcode sticker in industrial, retail store , mall and vegetables market. Barcode weighing scale's handing is easy due to its smart design.High quality rechargeable battery is used in this scale. Its battery backup is minimum 24 hrs in continuing uses.This weighing scale has front and back LCD display. High quality separate sticker printer is use in this scale. 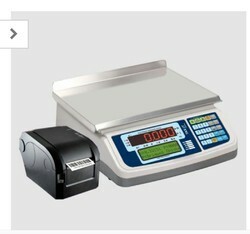 Data storage facility is also available in this Weighing scale.